1. WHISK flour with sugar, baking powder, baking soda and salt in a large bowl. Whisk buttermilk with butter, eggs and vanilla in a medium bowl. Scrape buttermilk mixture into flour mixture. Whisk until batter is just combined. It will be lumpy. 2. HEAT a large non-stick frying pan over medium. Spray with oil. Pour 1/3 cup batter into pan. If the pan is big enough, add more 1/3-cup portions of batter. Cook until bubbles form on top of each pancake and edges begin to brown, 2 to 4 min. 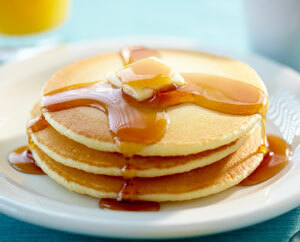 Using a wide spatula, flip and continue cooking until the bottoms of pancakes are golden, 2 to 3 min. Don’t press or they will become tough. Transfer to a plate. Repeat with remaining batter. Serve with berries and maple syrup.